Whether you're moving to France or buying a holiday home in France, you're chasing a dream. You certainly aren't doing it out of duty! So, it makes sense to look for a property that really fulfils that dream. After all, you can have "ordinary" at home in the UK. In much of France, the weather is so much better that an outdoor, even unheated pool can be used from May until October (Weather in France). So a property with a swimming pool is likely to be high on your list of requirements. Long, sunny summer days are always better spent to the shimmering blue backdrop of your own private pool. Why buy a French property with a pool in 2018? A property with a swimming pool is not just fun. It's a good investment too. If you are looking to rent out your home when you aren't using it yourself, you'll find that interest from potential renters is significantly higher than for property in France without pools. You only have to read the adverts for rental properties to see that "with private pool" is considered a top selling point. 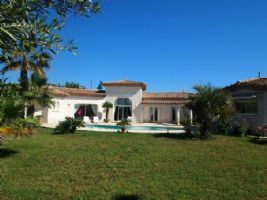 And properties for sale in France with swimming pools can be less expensive than you think, luxurious as they may sound. If you're looking to buy in 2018, with many properties being reduced in price, you're likely to be able to bag a real bargain. Swimming pools are great fun too. When you've got a pool, you can not only cool off on a hot summer's day, but get fitter and slimmer too. Did you know that energetic swimming burns 650 calories an hour? Of course, if you want to swim for fitness, a large pool is a distinct advantage. An Olympic pool is 50 metres long, but you don't need that much to exercise. As long as a pool is big enough to let you swim a good few strokes to a length, you can increase your fitness. 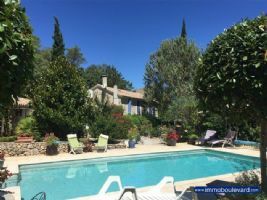 If you have always thought that a property in France with a swimming pool would be out of your reach, take a look at the properties we have below. Four of them are below 200,000 Euros. So pool properties in France might be cheaper than you thought! 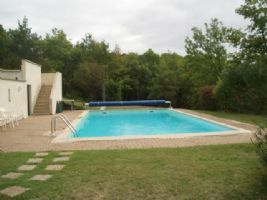 Grab a bargain – a well priced property with use of the gardens and pool. 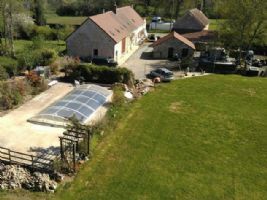 This is a super property situated in the countryside just outside of St Severin and Aubeterre sur Dronne. It is on a co-ownership complex which means all the outside maintenance and garden costs are shared. 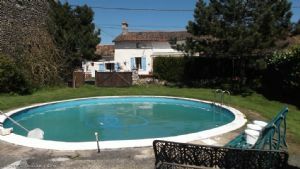 4 bedroomed stone property with a 1 bed gite and a pool, situated in a small, peaceful hamlet but only a 10 minute drive from supermarkets, restaurants, banks etc, and just 45 minutes from Poitiers airport. The main house would benefit from some updating/refreshing. The main house has a courtyard to the front and separate garden with an orchard a few metres away. 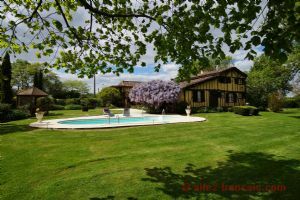 The gite sits on a separate enclosed plot of 480m2 opposite the house and has an in-ground pool, and will be sold fully furnished. Set in a small hamlet, 4 minutes from the village of Lussac-les-Églises and only 12 minutes from the village of Magnac-Laval. Le Dorat is 20 minutes drive and has train links to Bellac. you will find all the shops you need for everyday living in these three villages. The larger towns of Bellac and La Souterraine are 30 and 38 minutes drive respectively; Bellac having rail services to Limoges and Poitiers, and Poitiers train station has TGV connections to Paris, Bordeaux, London and Brussels. 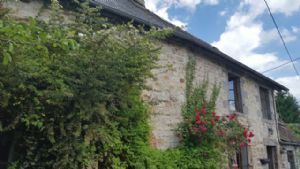 Oozing character and charm, this delightful property offers tranquility and seclusion in the heart of rural Gers. 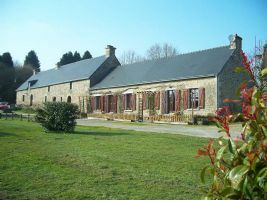 With a separate gite for income potential (or independent accommodation for family and friends), the two buildings are set in a pretty landscaped garden and ideally combine a superb rural setting with accessibility to amenities. Just 10 minutes away by car is a village with boulangerie and café/restaurant, and slightly further afield (15-20 minutes) Nogaro offers all main amenities. This Charantais style house has been fully restored and modernised to the highest standard and offers spacious and flexible accommodation. Situated in the village of Charzais, just 2 Kms from Fontenay le Comte, the current owners have been running the property as a very successful holiday rental business for over 10 years generating substantial yearly income. The Property is situated in a quiet hamlet, full of character being an old Provencal Farmhouse, considered to date from the 18th century. It has been completely renovated back to original features, many of which have retained in the interior. The main house consists of 4 bedrooms 3 doubles and 1 single , 2 bathrooms and WC's, lounge, fitted kitchen, study and cellar. Quality villa with 176 m² of living space including an independent studio on 2252 m² with pool. Superb quality single storey villa (2002) on a landcaped plot of 2252 m², with no overlooking and a beautiful pool. The home offers 176 m² of living space including 3 bedrooms, 2 bathrooms and an independent studio. Located at the edge of the village in a nice and quiet residential area, a few minutes walks from all shops. French Property Bargains - Two For One!